Carolina Football season is here! Our pick of the week is Gamecock Jewelry! From Carolina rings, earrings, bracelets, necklaces and more, we have a huge selection to choose from! Do you know about the Championship Challenge? Purchase any item from the 10 vendors that we have (Nike, Under Armour, Cutter and Buck, Oakley, Columbia, Ping, Tervis, Guy Harvey, Antigua and New Era) and if the Gamecocks win the Championship, you will get a full refund of the item/s that you purchased. You must keep the receipt of the item, as well as the Championship Challenge entry form to receive a refund. View this video below for more information about it! Also, every week we have the “Bonus Play of the Game” check out more details here. You can download the .pdf form, to fill out and take it to any Garnet and Black Traditions store to enter. And if you haven’t already, be sure and connect with the Garnet and Black Traditions facebook page and our Garnet and Black twitter page for updates, promos and more! 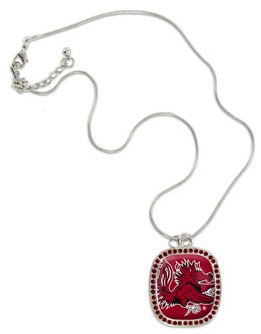 We also have have a large selection of Gamecock Fashion Jewelry on our sister site: Garnet and Black Traditions – like these pieces up above. This entry was posted in Jewelry, Pick of the Week and tagged carolina gamecocks, carolina jewelry, championship challenge, gamecock jewelry, gamecocks, gamecocks jewelry, university of south carolina gamecocks, university of south carolina jewelry. Bookmark the permalink.